14" Net.Media Center is designed to serve as the central distribution point for voice, data, video, audio, and security services. The 14.25" W x 14" H x 3.68" D center features up to 8 mounting spaces with 2 AC knockout for power, 4 top, 3 bottom, 1 per side, and 4 back 2 diameter cable access knockouts, and 4 cable tie anchor points per side. 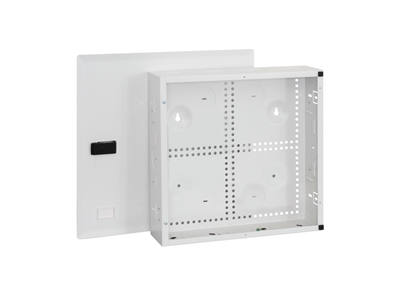 Ideal for small installations with limited space in single family and multi-unit housing.